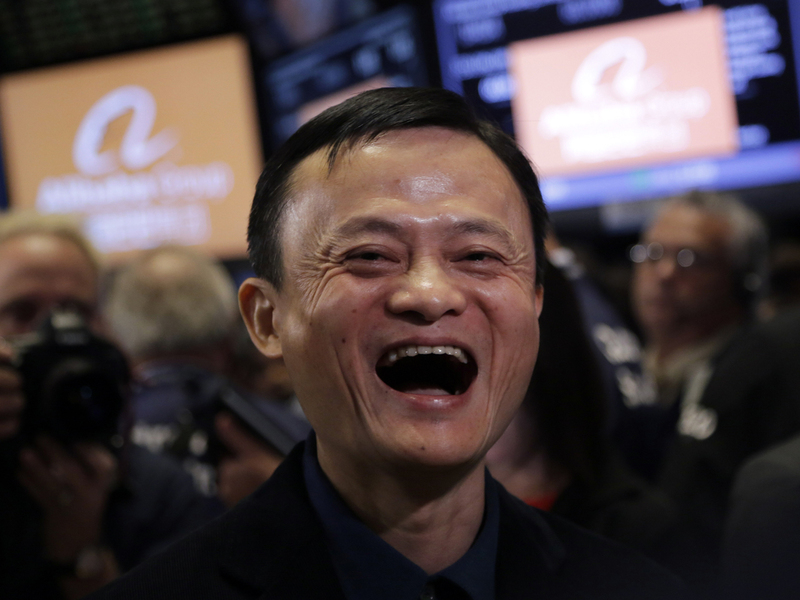 Alibaba (BABA) is officially the biggest U.S. initial public offering of all time. When market makers at the New York Stock Exchange finally gave the OK for the shares in the Chinese e-commerce company to start trading Friday at 11:53. a.m., the opening price was $92.70. The stock quickly jumped to $96.29, shooting up 42 percent from the $68 a share the initial public offering priced at last night and lifting Alibaba's market capitalization to $236 billion. That makes it more valuable than U.S. giants such as Facebook (FB), which has a market value of $200 billion, Amazon.com (AMZN), at $150 billion, and Citigroup (C), $163 billion. Even Walmart (WMT), the world's biggest retailer, is only slightly more valuable than Alibaba in market terms. Alibaba raised $21.8 billion in the offering. The IPO is the biggest ever in the U.S., outpacing Visa's (V) $19.7 billion initial stock sale in 2008, and General Motor's (GM) $18.1 billion IPO in 2010. Agricultural Bank of China and Industrial & Commercial Bank of China raised $22.1 billion in 2010 and $21.9 billion in 2006, respectively, in listing their shares in Hong Kong and Shanghai. Although demand for Alibaba shares was strong among large institutional investors, it remains to be seen whether retail investors will embrace what is, after all, a foreign company with little presence in the U.S. As of 1:21 p.m. ET, Alibaba shares, trading under the ticker symbol "BABA," were at $90.05, below the opening price, but still up 32 percent from the offer price. They ultimately closed at $93.89, a solid 38 percent higher. "At its intended IPO price it looks like it was reasonably priced when compared to other companies of similar ilk," said Mark Luschini, chief investment strategist at Janney Montgomery Scott, noting that the broker-dealer did not plan to buy Alibaba shares today. "Now at its IPO price, it's less attractive than it was before from our viewpoint as value investors." Luschini added that some investors may wait to see if Alibaba's stock prices comes down once the excitement dies down, noting that shares of Facebook and Twitter (TWTR) slid after their IPOs. The average one-day return in the first day of trading for IPOs bigger than $10 billion is 9 percent, according to an analysis from Dealogic. The biggest one-day gain was captured by Visa (V), which jumped 28 percent in its first day of trading in March 2008. Alibaba might also get a lift from general market exuberance, given positive momentum after Scotland's vote to remain in the U.K., which settled some uncertainty in the global markets. Still, Alibaba is facing some headwinds. Smaller U.S. investors aren't familiar with the company, given that the majority of its business is conducted in China. Critics have raised questions about governance issues, given that company insiders control Alibaba yet own only a small percentage of capital. The IPO also isn't for Alibaba Group itself, but for a different entity that owns an interest in it. "Let's see what transpires in the next month, quarter and year," said Richard Peterson, senior director of global markets intelligence with financial research firm S&P Capital IQ. "In the market, sometimes initial euphoria gives way to reality soon thereafter." Yet the size of the Chinese market, and its fast-growing middle class, is appealing to many stateside investors. The company, which handles 80 percent of all online shopping in China, makes money through transaction fees and online marketing. Of course, regardless of how Alibaba's shares trade today, the real test will be whether it can deliver on American investors' high hopes in the long term.